William Turner (1766-1853) was born at Seathwaite, Leicestershire to a local quarry owner. In 1800, he formed a partnership with William and Thomas Casson from Cumberland. (Thomas would go on to found Casson’s Bank.) Turner lived at Plas Brereton, Caernarfon, whilst George and William Casson, his sons lived at Blaenyddol, Llan Ffestiniog. Hugh Jones, a banker from Dolgellau joined them in due course, the company being known as William Turner & Co. and later as the Diphwys Casson Slate Co. This was only a part of the vast development that saw twenty-seven quarries working in Blaenau Ffestiniog by 1881. (It is also interesting to note that William Turner and Hugh Jones joined Thomas Assheton Smith and Thomas Wright to operate the Dinorwig Quarry, Llanberis, in 1809. 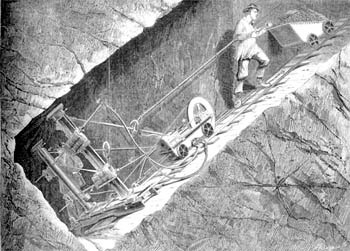 Indeed Turner was to be responsible for running many quarries. Another important figure in the Ffestiniog Slate Quarrying era was Samuel Holland the younger (1803-92), pictured right. His father, Samuel Holland the elder, (1768-1851) was involved in the lead, copper and slate industry in North Wales, and was also a prominent slate merchant for Penrhyn Quarry in the early 1800s. Samuel the son was educated in England and Germany before joining his father’s company as an office boy. At eighteen years old, his father sent him to Blaenau Ffestiniog to take charge of the Rhiwbryfdir Quarry. He subsequently became an important figure in the company. It was his idea to build a railway from Blaenau to Porthmadog, where he set up a Savings Bank in 1845. He was responsible for founding many Book Clubs, elementary schools, as well as the Dr. Williams School for Girls at Dolgellau in 1875. Elected as High Sheriff in 1862, he then represented the county in Parliament as a Liberal from 1870 to 1885. Apart from all this, he was also very interested in farming and reared between fifteen hundred and two thousand sheep on the mountainsides by Rhiwbryfdir. Both farm and quarry prospered. Indeed, as early as 1852 he had installed gaslight underground and had developed slate dressing machines. Elizabeth Gaskell, the Victorian novelist was a cousin to him. John Whitehead Greaves (1807-80) was born the third son of John Greaves, a Quaker and banker from Radford, Warwickshire. His grew up into a wandering adventurer, having postponed his intention to sail as an immigrant to Canada from Caernarfon in around 1830, decided to go into partnership with Edwin Shelton, from Grimley, Worcestershire. Together they took a ‘take-note’ (short term exploratory option) at the Glynrhonwy Quarry, Llanberis; a quarry that had been worked since 1804 and had recently bankrupted one lessee, John Roberts of Liverpool to the sum of thirty thousand pounds. Roberts had also been lessee to Lord Newborough of the Bowydd Quarry at Blaenau Ffestiniog. Having taken both quarries on a twenty-one year lease, Shelton took charge at Glynrhonwy and Greaves at Bowydd. This was a period of unprecedented industrial growth, which saw the founding of the North and South Wales Bank, (taken over by Midland in 1908) and also the building of the Ffestiniog Railway, to which Greaves acted as treasurer from 1843-47 and as chairman from 1843-47 and 1850-57. 1842 was also the year of the Great Fire of Hamburg, which created a huge demand for Welsh slate. Greaves soon realised that there had to be an abundance of slate under Llechwedd y cyd, the land that separated the Bowydd and Foty Quarries from the Rhiwbryfdir Quarry. He formed a partnership with the second Lord Newborough and William Edward Oakeley. But the prolonged search for the Merioneth Old Vein nearly destroyed Greaves financially before he struck the elusive slate deposits in 1849. Like Holland, he developed slate machinery, and in 1851 enhanced the name of Llechwedd Slate by winning a Class 1 Prize Medal at the Great Exhibition. The order books began to bulge and he was awarded a contract the following year to supply slates for Kensington Palace. Another medal would be won at the London Exhibition in 1862 and at the Paris Exhibition in 1867. He also branched into the shipbuilding industry at Porthmadog. Edwin Shelton had died in 1848, but Greaves carried on working Glynrhonwy until 1862, though not surrendering the lease until 1873. John Ernest Greaves (1847-1945) was born at Tan-yr-allt, Tremadog but spent most of his childhood at Llechwedd, being educated at schools in Warwickshire, Edinburgh and Dorset before going to Oxford. On coming down in 1870, his father left him to manage Llechwedd and to live ‘on site’ at Plas Weunydd. In 1874 he was one of the founder members of the Madoc Lodge No 1509 of Free and Accepted Masons. Five years later he married Marianne Rigby, a granddaughter of Samuel Darbyshire, owner of the Penmaenmawr Granite Quarries. With his increasing wealth he began to build properties and own land on both sides of the then county boundary, being appointed a Justice of the Peace, High Sheriff and Deputy Lieutenant for Meirionydd in 1884, High Sheriff for Caernarfonshire in 1885, and a Justice of the Peace and Lord Lieutenant of the county in 1886. The previous year he handed over the role of general manager at Llechwedd to his brother Richard Methuen Greaves, though remaining as chairman of the syndicate. He also served as chairman of the Caernarfonshire Quarter Sessions from 1890-1929 and as chairman of the County Council in 1906. In 1900, the three brothers, J.E. Greaves, R.M. Greaves and Edward Seymour Greaves together with their respective wives formed themselves into a limited company. Winning the gold medal at the Buenos Aires World Fair in 1910, brought in many valuable South American orders. It was also decided the following year to offer the job of general manager and engineer to Martyn Williams-Ellis (1885-1968), grandson to J.W. Greaves. The Great War prevented him taking up the post as intended in 1914, but his impact was immediate after 1918, when he decided to undertake a complete process of modernisation and mechanisation, which transformed the outlook at Llechwedd. In 1931, the company decided to buy out the grazing rights of the Tanybwlch and Glynllifon and proceeded in 1936 to untop the mine in order to gain access to the pillars of first class slate left to act as supporting pillars since Victorian times. Llechwedd was fast becoming an efficient operation with great potential. George Whitehead Greaves (1889-1953) became chairman in 1945. But after his untimely death in 1953, in mysterious circumstances during the Mau Mau revolt, Martyn Williams-Ellis was appointed Chairman and managing Director. He undertook the untopping scheme in 1931 so as to improve quarry production. He was succeeded by his son John Williams-Ellis (b.1923) As has been noted already, Llechwedd, under the Greaves Group of Companies, is a thriving business geared to industrial and tourist needs. One of the longest serving Liberal Members of Parliament representing a Welsh constituency at Westminster, during the twentieth century, apart from David Lloyd George, was Sir Henry Haydn Jones (1863-1950). He lived at Pantyneuadd, Tywyn, and held the seat of Meirionydd from 1910 until his retirement in 1945. A son of the minor Welsh composer J.D. Jones (1827-70), he was brought up at Rhuthun where his father set up the exceedingly anglophile private grammar school of Clwyd Bank. Educated at Tywyn, he was adopted by his uncles and set up in business by them as a hardware merchant at 22 High Street, Tywyn. In 1903 he married Barbara, daughter to Lewis D. Jones, who was originally from Tywyn but had emigrated to the U.S.A, and set up as an ironmonger and quarry owner in Chicago. As a politician he was not a roaring success, but he did edit a collection of hymns and hymn tunes which was published in 1910 under the title Cân a Moliant. He was knighted in 1937. 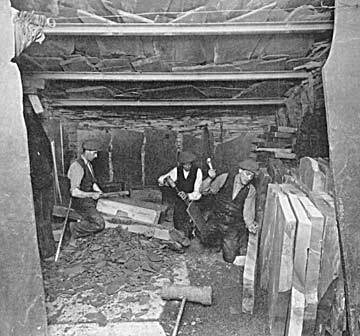 Slate Quarrying at Abergynolwyn dated back to the 1840’s but by 1909, due to the quarrying of all the best rock and the lack of capital investment for many years it was in decline. As a newly elected M.P., Haydn Jones’s attempted to find a buyer for the Abergynolwyn Quarry, but with no success. In January 1911, he bought the quarry, village and the Tal-y-llyn Railway himself for five thousand, two hundred and fifty pounds using borrowed capital. Before the end of the year, the Abergynolwyn Slate and Slab Company Limited had been formed with Haydn Jones as sole director. In 1935 he purchased the lease on the Aberllefenni Quarry. In 1956 the company changed its name to the Aberllefenni Slate Quarries Limited and was still trading under that name in 1999. A post war boom was experienced at Abergynolwyn, but it was short-lived. In December 1939 there was a serious cave in, but fortunately without loss of life. Production ceased in 1946. The Tal-y-llyn Railway first opened in 1865 still continues to run as a tourist attraction.